OCAW programs reflect our mission and seek to foster a sense of leadership, community and civic responsibility. We are committed to our youth and created the prestigious OCAW Presidential Classroom Scholars Program for high school students. We have also joined with the Gates Millennium Scholars to create further scholarship opportunities for Chinese American students. On an international level, we work with the Tiger Woods Foundation to offer the OCAW Scholarships for Girls in Rural China. We strive to promote Chinese Americans in the arts through our involvement with Opera International and the Li Foundation. 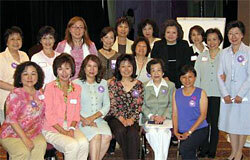 Recently, OCAW and the Center for Creative Leadership have joined together to create the Chinese-American Women’s Leadership Program, an exciting and important initiative to strengthen leadership development. In addition, we offer numerous local chapter conferences and banquets that provide wonderful opportunities for community interaction. If you’d like to become involved with any of OCAW’s programs just let us know!